Spanning back thousands of years, the field of medicine in Sri Lanka has been a constantly evolving sphere of science and tradition. Sri Lanka had its own form of holistic medicine known as deshiya chikitsa; over the centuries this form of medicine was influenced by the ayurvedic medicine of India and is still practised by modern day ayurvedic doctors in the country. As stated in the book A History of Medicine in Sri Lanka, physician and historian C.G. Uragoda notes that the influences of other countries, such as China and Portugal too, brought in different medical and surgical techniques to the island. A few of these techniques are mentioned below. One of the most interesting artefacts is the medicine trough—known as the beheth oruwa in Sinhalese. According to Uragoda, the first of these sarcophagus-like stone receptacles was found in the Thuparama monastery at Anuradhapura. “These structures intrigued archaeologists for quite some time till it was realised that they were found in the vicinity of ancient hospitals… It was then suggested that these structures were items of equipment used in hospitals. Evidence from old ayurveda texts lend indirect support to this theory,” Uragoda notes. Uragoda also mentions that these medicine troughs, were used in a form of treatment known as immersion therapy—which was used to manage skin conditions and diseases such as rheumatism and hemorrhoids. 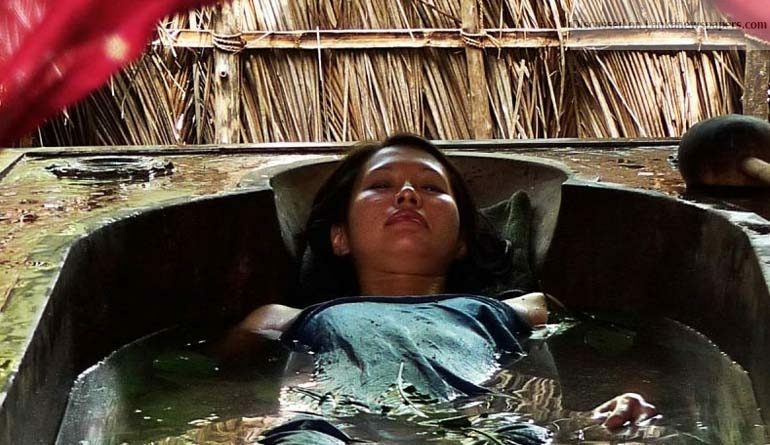 Infusions of medicinal herbs, milk, ghee, oils, and vinegar were some of the liquids used in immersion therapy, which were absorbed into the affected person’s skin by soaking in the trough—much like soaking in a bathtub. The troughs discovered at ancient hospital sites in Anuradhapura, Polonnaruwa, Mihintale, and Medirigiriya are believed to date back to the 9th century A.D. However, Uragoda notes that ancient Pali Buddhist canons which date back to the 5th century A.D also make mention of immersion therapy. It is a method of treatment which is now rarely in use. Even in instances where it is used—like in Ayurvedic medicine—a small wooden bathtub is utilised, unlike the stone medicine troughs of old. A History of Medicine in Sri Lanka also refers to acupuncture, a treatment which was historically used by ayurvedic physicians—especially those who were in the South of the country. This treatment was quite similar to Chinese acupuncture—it called for the piercing or cauterising of certain points on the human body. It is believed that this practise may have been an indirect influence of Chinese medicine, through the spread of Mahayana Buddhism in South and East Asia. Uragoda mentions that the basic tools used for this procedure consisted of a tapering metal rod—which was used for puncturing—and another with a blunt end—which was used to cauterise the skin. These tools were locally manufactured, and several—which date back to the 17th century—are on display at the Folk Museum in Anuradhapura. Until the Portuguese migrants arrived in the 16th century, Sri Lanka had no contact with Western medicine. Certain Portuguese medical techniques—which were influenced by the Moors of Spain—were introduced after areas along the coastline were colonised. One such technique was the use of snakewood as protection against snake bites. According to Uragoda, snakewood was believed to be an antidote for snake venom because Garcia da Orta—a Portuguese physician who lived in Goa in the 16th century—noted that the mongoose would rub itself against the root of a snakewood plant before it fought with its natural rival—the cobra. Uragoda goes on to say that da Orta’s high regard for snakewood as a protection against snake bites was based on evidence he had gathered from Sri Lanka. da Orta had also classified three Sri Lankan plants as snakewood. These plants have not been clearly identified, but many have made speculations, including Ceylonese surgeon and academic Sir Nicholas Attygalle. He stated that the three Sri Lankan snakewood trees could be Indian leadwort (Plumbago rosea), Indian snakeroot (Ophiorrhiza mungos) and Touch-me-not (Mimosa pudica), which is commonly known in Sri Lanka as nidhi kumbha. Uragoda also mentions that the snakewood plants were also used to prevent the spread of rheumatism, smallpox, measles and cholera. A bezoar stone is a concretion found in the stomach of male goats. A History of Medicine in Sri Lanka mentions that the medicinal properties of the bezoar stone was first identified by the Arabs. In turn, the Portuguese began to use bezoar stones for a variety of illnesses and health conditions. “Wealthy persons took it in rose water twice a year in order to preserve their youth. It was also used for prickly heat, leprosy, and malaria. As a local application it was employed in the extraction of poisons in ulcers, and for the bites of mad dogs and other animals,” Uragoda writes. At the time the Portuguese were in control of the coastline, the island of Delft, off the coast of Jaffna, became famous for the use of such stones—to a point where even ships from Bengal would stop over at the island to collect them. Uragoda also mentions that the Portuguese attributed similar medicinal properties to the stones found inside the gallbladder of hogs, which were found both in Sri Lanka and Malacca. These stones were given the name pedro de porco by the Portuguese, which translates to hogstone. The Dutch, too, valued the use of these stones in medicine, but as time passed its use diminished. Venesection—also known as phlebotomy—is the surgical opening or puncturing of a vein in order to let out blood, to draw blood or to introduce a fluid. It is said to be the oldest and most widespread surgical operation in the world, and was used as treatment for various illnesses throughout history. As Uragoda states, the process was practised in ancient Sri Lankan Ayurvedic medicine with the application of leeches. It was the Portuguese who introduced the method of cutting the vein with a small, sharp surgical knife called a lancet. While some of the techniques mentioned above would have been rather frightening and painful, they were the procedures used by the physicians of olden-day Sri Lanka in the hopes of treating their patients. Some of them—like the use of snakewood and bezoar stones as treatments—may not be in use anymore, but other treatments like immersion therapy and acupuncture are those which people still favour over the use of western medicine. In fact, Acupuncture and Ayurveda are two of the five traditional medicine systems which are still practised in the country. Reference: A History of Medicine in Sri Lanka from the earliest times to 1948 by C. G. Uragoda (1987). Published by the Sri Lanka Medical Association.